Subsequent to release of the updated Québec Public Health Program (QPHP), the Direction générale de la santé publique of the Ministère de la Santé et des Services sociaux (MSSS) made public its strategy for the development of public health research (Stratégie pour le développement de la recherche en santé publique, 2008). This strategy proposes guidelines based on, among other things, the results of a review of public health research in Québec (Bilan de la recherche en santé publique au Québec). One of these guidelines calls for strengthening of the capacity to use research results in the health and social services network. Among the priority actions mentioned is the development of various forms of partnership involving funding for the production of knowledge, such as knowledge syntheses, experimental projects or feasibility studies. Another priority is the implementation of effective knowledge translation strategies. These guidelines are part of a broader movement promoting knowledge translation and use. In fact, numerous policies promoting innovation call for more fruitful dialogue between science and society aimed at increasing the benefits derived from research supported by public funding. In general, there is also a desire among organizations within the government, academic, community and private sectors to foster greater use of the available knowledge so as to bring about changes in practices and in decision making processes. In Québec, as elsewhere, the strengthening of knowledge translation mechanisms is increasingly becoming a priority. 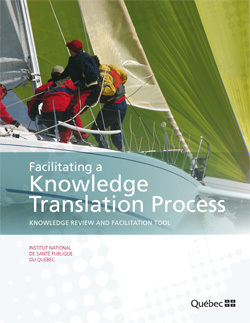 It was within this context that, in 2008, the MSSS mandated the Institut national de santé publique du Québec (INSPQ) to produce a knowledge synthesis on knowledge translation (KT), with a view to supporting action. In public health, as in the field of health in general and in the social sciences, there is a significant gap between the knowledge available and the use of that knowledge. Despite the devotion of considerable effort over the course of recent years to implementing innovative strategies at the central, regional and local levels, there is still much to learn about how to increase knowledge use and there is a great need for tools and training that can further the development of better practices in the area of knowledge translation. Designed with a view to supporting action, this document first presents an overview of existing knowledge about the translation of knowledge in the health field. On the basis of the available literature, this knowledge review identifies the main elements to consider when attempting to implement more structured knowledge translation practices. This information is synthesized and a dynamic and integrated conceptualization of the knowledge translation process is presented in the next section. The document's annexes include a tool for facilitating a knowledge transfer process and a summary diagram that illustrates at a glance the contents of this publication. While it is intended for public health actors, the contents of this document can be applied in a variety of contexts. Thus, it is addressed to a broad audience of managers, decision makers, stakeholders and public policy makers working in various activity sectors, as well as to professionals acting as liaison officers, knowledge translation officers, researchers or knowledge brokers in their respective sectors. Nevertheless, for public health actors, this document offers the advantage of using examples drawn from their reality and providing them with points of reference for their practices.